NICE objective is to generate electricity from the sun thus reducing reliance on electricity derived from fossil fuels, helping to reduce carbon emissions, provide energy savings, build community resilience and strengthen the local economy. NICE projects phase1 and phase 2, installed solar pv arrays between 4 kW & 15 kW, FREE OF CHARGE, to 18 Northern Ireland 3rd sector organisations, totalling 190 kW. These community groups collaborating with NICE benefit from a solar panel array installed entirely at NICE’s cost, i.e., the community organisation pays nothing for the installation, the participating organisation entered a ‘share your roof’ agreement with NICE. The collective purchase of insurance, maintenance, performance and monitoring of systems – NICE handle all such matters and associated costs. The PV systems are owned and maintained by NICE for a period of 20 years (A 20 year rent-free lease of the panels, after which the ownership of the solar installation outright passes to the building owner. (Total expected life of panels is 35-40 years)), and will take advantage of the lower prices available from large scale purchasing. The ROCS generation and electricity export tariffs return to NICE, repaying the interest on shares and any capital loans, covering overheads and contributing to a community fund for future renewable energy initiatives and energy efficiency services. The electricity generated by the NICE installed solar panels is available for use in that community building at a considerably reduced rate compared with the cost of the equivalent electricity taken from the National Grid. Each unit of solar-generated electricity used effectively replaces a unit of electricity that the Group would otherwise have to purchase from their electricity supplier AND they pay NICE only 5.5p uplifted annually RPI linked per kWh (unit) for any solar-generated electricity used in the building, representing an average saving of 10p* per kWh (*calculated on an average current cost of 15.5p kWh). Non-residential buildings generally use the majority of the electricity generated from the size of PV installation proposed by NICE, thereby maximising savings to the building owner. This not only reduces the running costs of the community building but also insures against future energy cost increases. 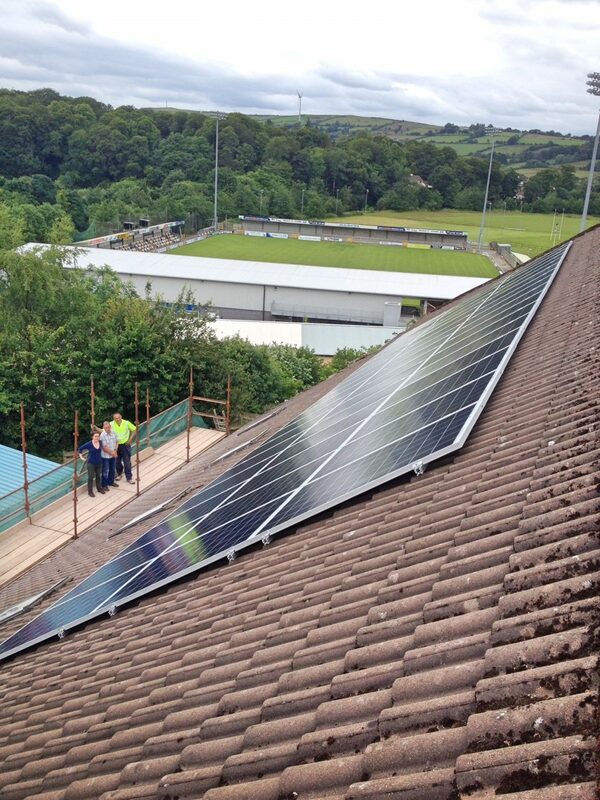 And by allowing the local community to both invest in and share in the benefits of solar pv installation the whole community benefits. Participating community organisations became a member of our Co-Operative and a co-owner of the enterprise, involved in its running and decision making processes. The advantage of this project is that the money from the tariffs stays in Northern Ireland and benefits the local community. Investment opportunities will be made available, funding for future projects will be generated, and later phases of the project may have potential for job creation. Our community share offer helped us raise the necessary funds, offered investment opportunities for the community the particpating organisations serve and for their centre, this gives a share interest return to the very people interested and supporting what NICE does.